The active balun and crossed-dipole antenna may be ordered as described below. A brief technical description and application information is here but for detailed technical information refer to the Long Wavelength Array Front End Electronics memorandum series. Also, this paper describes the details and motivations behind the antenna design in 2012 and provides many details such as wind survivability, construction and installation: A Wide-Band, Active Antenna System for Long Wavelength Radio Astronomy by Brian Hicks at the Naval Research Laboratory (and others). 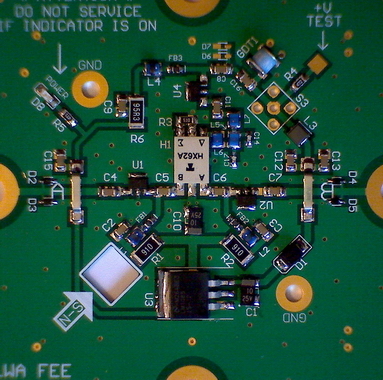 The active balun, called Front-End Electronics (FEE) in the original engineering documents, consists of two identical printed circuit boards (PCB). Each PCB contains approximately 60 individual parts, all surface mounted except the RF connectors. See additional images at the bottom of this page. The usable frequency range of the FEE is approximately 500 kHz to 115 MHz (but we only test them from 5 to 110 MHz). We offer only a ready-built and tested version from the original equipment manufacturer (OEM). The active balun is a dual assembly and contains the electronics for use with one crossed-dipole antenna but it does not include its enclosure (the enclosure is part of the Crossed-Dipole Antenna below). We offer a crossed-dipole antenna consisting of four blades (or wings) and supporting mast and rods, enclosure for the active balun and all fasteners and hardware. The design frequency range is approximately 5 to 90 MHz. 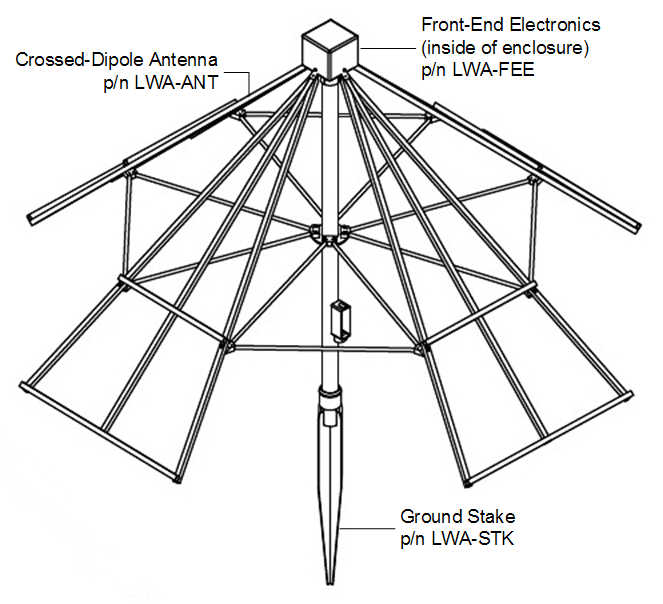 The antenna we offer is identical to the antenna used at the LWA and shown below but is broken down for shipment (chicken wire ground screen and cables are not included). The four blades (or wings) that make up the two dipole antennas are ready for field assembly using common tools. The steel center mast has nominal 2.375 in (60 mm) outside diameter. A ground stake to support the center mast is optional but is recommended for most installations. The stake is designed to be driven into the ground and includes a collet and collar assembly to hold and support the antenna mast. Other ground support methods are possible and may be necessary depending on the terrain; however, we do not support any other method at this time. The shipping configuration depends on the number of antennas ordered. The shipping carton for one set of antenna blades is approximately 4 x 40 x 64 inches (0.1 x 1.0 x 1.6 m). The center mast and ground stake usually are shipped in separate packages. The total shipping weight for a complete antenna is approximately 50 lb (23 kg). When inquiring or ordering, please provide your complete shipping address including postal (zip) code and telephone number. Be sure to put meaningful text in the Subject field of your email or your inquiry will be trapped by our spam filters and never delivered. Prices do not include taxes, duties or tariffs. Charges for customs and brokerage fees may apply to international orders.